Moms know best. My mom has been mentioning Lagundi leaves as an alternative medicine for coughs, colds, etc for the past several months. I didn't know what it was and how it can be used to cure the aforementioned illnesses, so I decided to google it. Searching for it gave me the knowledge that Lagundi (Vitex Negundo, scientific name) is one of the ten herbal medicines endorsed by Department of Health. It should be boiled in water then mixed with any other liquid before being drank by someone sick. But an easier and tastier alternative for medication is by just purchasing ASCOF Lagundi, which is made from 100-percent Lagundi leaves as well. I found out that celebrity and congresswoman Lucy Torres-Gomez, wife of Richard Gomez, uses ASCOF Lagundi for her daughter Juliana. For Lucy, nothing comes close to ASCOF Lagundi when it comes to treating Juliana for coughs. 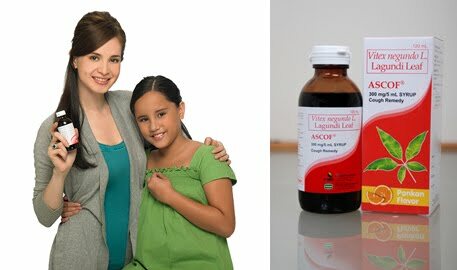 Coming from a trusted name in consumer healthcare, Pascual Laboratories has made ASCOF Lagundi to come in syrup (Ponkan, Strawberry, Menthol and Menthol Sugar-free flavors), tablet or capsule formats to suit everybody's needs. With ASCOF Lagundi, parents are sure there are no chemicals that may produce side effects, such as palpitations, intestinal bleeding, drowsiness or damaged liver. Remember, medications in the first place must make us go back to being healthy, rather than expose us to more health risks.